The ephemeral reward task provides a subject with a choice between two alternatives A and B. If it chooses alternative A, reinforcement follows and the trial is over. If it chooses alternative B, reinforcement follows but the subject can also respond to alternative A which is followed by a second reinforcement. Thus, it would be optimal to choose alternative B. Surprisingly, Salwiczek et al. (PLoS One 7:e49068, 2012. doi: 10.1371/journal.pone.00490682012) reported that adult fish (cleaner wrasse) mastered this task within 100 trials, whereas monkeys and apes had great difficulty with it. The authors attributed the species differences to ecological differences in the species foraging experiences. However, Pepperberg and Hartsfield (J Comp Psychol 128:298–306, 2014) found that parrots too learned this task easily. 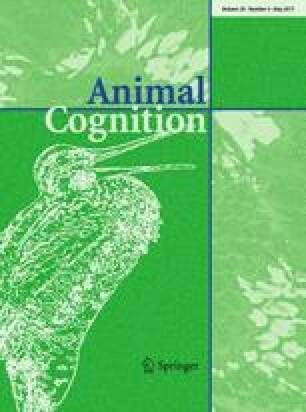 We have found that with a similar task pigeons are not able to learn to choose optimally within 400 trials (Zentall et al. in J Comp Psychol 130:138–144, 2016). In Experiment 1 of the present study, we found that rats did not learn to choose optimally in 840 trials; however, in Experiment 2 we added a prior commitment to the initial choice by increasing delay to reinforcement for the choice response from a single lever press to the first lever press after 20 s (FI20 s). In a comparable amount of training to Experiment 1, the rats learned to choose optimally. Although the use of a prior commitment increases the delay to reinforcement, it appears to reduce impulsive responding which in turn leads to optimal choice. All procedures performed in studies involving animals were in accordance with the ethical standards of the Institutional Animal Care and Use Committee (IACUC) at the University of Kentucky. The procedures were consistent with the USA and State law.